There are only two days left in this year’s 12 Days of Randonneurmas gift list, but still plenty of time to grab that special item for the cyclist. Today we turn to … pants. 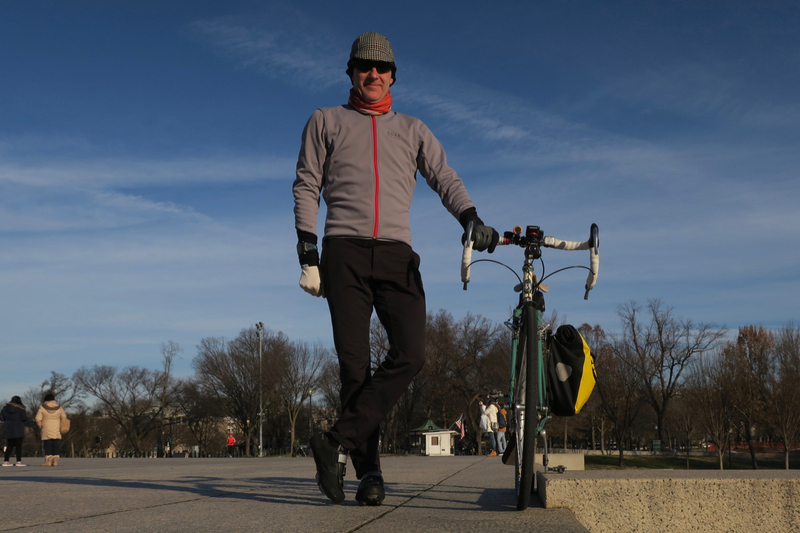 I’m talking about pants for cyclists who use their bikes for transportation, particularly those who ride in the cold. I had the chance to try on the midweight Swrve Downtown Trousers at the Philly Bike Expo a couple of years ago and have been wearing them as winter commuting pants ever since. They have a light fleece brushed interior and a little stretch to them. I find them warm in temperatures below freezing, especially when paired with tall winter socks and thermal bibshorts . The are gusseted to make them comfortable on the saddle and have tapered legs – no ankle bands required! But what I really like is that they don’t look like cycling gear. They blend in nicely at the office or coffee shop, and are great for travel. Durability is good: mine have yet to show much wear. At $125 MSRP I was hesitant about buying winter-specific pants, but the investment has been a good one. If you are reading this when I published, know that Swrve has a sale on these right now. They run true to size in regular fit, which was my preference over the slim ones. If you’re keeping it stylish, these are pants to consider! Tomorrow: the winter solstice is here, but that’s no reason not to ride.